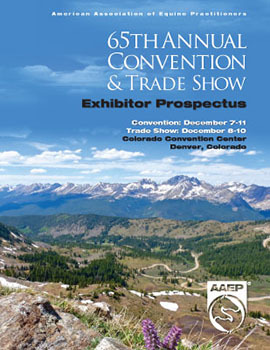 Thank you for your interest in the AAEP Annual Convention & Trade Show in Denver, Colorado, December 7-11, 2019. If you wish to exhibit, please complete and return the booth application. We will review your application and, if accepted, you will be contacted with a booth assignment. 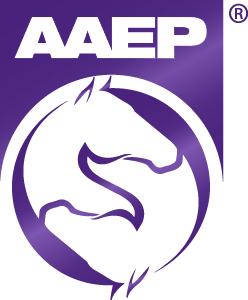 The AAEP Trade Show, December 8-10, is a valuable opportunity to promote your product or service to thousands of equine veterinarians, veterinary students and technicians. With more than 300 exhibiting companies returning each year, the Trade Show facilitates customer connections and increases visibility for businesses that serve the veterinary profession and horse industry. Click on the image to view the 2019 Exhibitor Prospectus. Personal interaction with more than 3,000 practitioners, students and technicians during the world’s largest meeting dedicated to the equine veterinary profession. Complimentary listing in AAEP publications, including the Exhibitors Guide in the 2018 Annual Convention Program. Exhibitors will also be listed in the AAEP Convention App. Opportunities to advertise in the 2018 Convention Program and the AAEP’s scientific journal Equine Veterinary Education. Opportunities to promote your brand through event participation and session sponsorship during the event. If you have any questions or would like to purchase available booth space, please contact Debbie Miles, Trade Show Coordinator, at dmiles@aaep.org or (859) 705-0423.